As a player in the rapidly progressing disc golf economy, Discmania comes off as more slow burn than wildfire. In the nearly eight years since its first disc was PDGA-approved, the Finland-based, Innova-produced brand has released a mere 17 molds, working out to an average of just over two molds per year. By comparison, some of its competitors have churned out new products at a much more prolific rate. Latitude 64 has averaged 4.1 approvals per year in its lifespan (37 molds, nine years); MVP Disc Sports has put out 3.8 molds every time the calendar has changed in the single digit column (21 molds in 5.5 years – and that’s not including its Axiom Discs offshoot); and Dynamic Discs has produced a whopping 6.2 molds annually in its short time as a manufacturer (14 approvals in 2.25 years). Why do all of this math? To make the point that when Discmania announces a new disc, I take notice, because it isn’t happening every day. Add to that how the company was marketing its new CD2, and I was licking my chops at the thought of what the new mold would bring to my game. Described by Discmania as a “pretty close relative” to its CD (Control Driver) and PD (Power Driver), the CD2 (Control Driver 2) was assigned a home as the first speed 9 driver in the company’s lineup. Noodle arm max speed? Check. Noodle arm distance and control? Check. Womp womp. “Most overstable” and noodle arms don’t exactly mix. The CD2, it seemed, was like that girl who you finally worked up the courage to ask out after all those years, only to find out that she is moving in a week. You get yourself all fired up, then boom – you come crashing back down to reality. Still, I had gathered the nerve at this point, so it was time to take the plunge. I acquired a new, 166-gram G-Line CD2 in a trade and, with low expectations and a heavy heart, prepared to face the reality of another failed attempt at throwing something too overstable for my noodly arm. The G-Line CD2, ready for take-off at Kit Carson Park. There’s a little park near my house that I like to refer to as my “driving range.” It’s fairly narrow, with a tennis court on the left side and houses on the right. But it’s long enough to air out new discs, and the narrow confines really make me focus on my lines. Upon receiving my new CD2, I promptly took it out to the driving range for a quick test. The first thing I noticed was how flat it was; the lack of dome was stark compared to the rounded tops of the Westside Discs Hatchet and Dynamic Discs Thief that dominate my tee shots. Aside from that, though, the plastic was like butter. This run of G-Line was slightly flexible, had a great, pearly sheen to it and just begged to be thrown. So that’s what I did. I threw the CD2 – right into a chain link fence, way left of my aim. Yes, left. That’s the understable side for a lefty, but it wasn’t like I had been eating my spinach and turned this thing over on the first throw. Instead, I just grip locked it. The aforementioned flatness was really throwing me off, so it took some adjusting my grip to really feel comfortable with it. Even thrown into a chain link fence less than 100 feet away at full speed, though, this G-Line plastic didn’t even show a scuff. Durability was not going to be a problem. Fences now out of the way, it was time to take the CD2 to the course for what I like to call the Workhorse Test. The main crux of the Workhorse Test is this: neglect all other drivers and throw only the disc in question for each drive, regardless of line. I find the Workhorse Test to be a vastly important measure of how useful a new driver will be to my game. I tend toward the neutral in terms of disc selection, preferring to put one or two discs per speed class on a certain angle and do the work myself, rather than bagging four to five molds per speed class to cover the full spectrum of understable to overstable. For one, it makes me earn the shot, if you will, which I find to be incredibly rewarding. 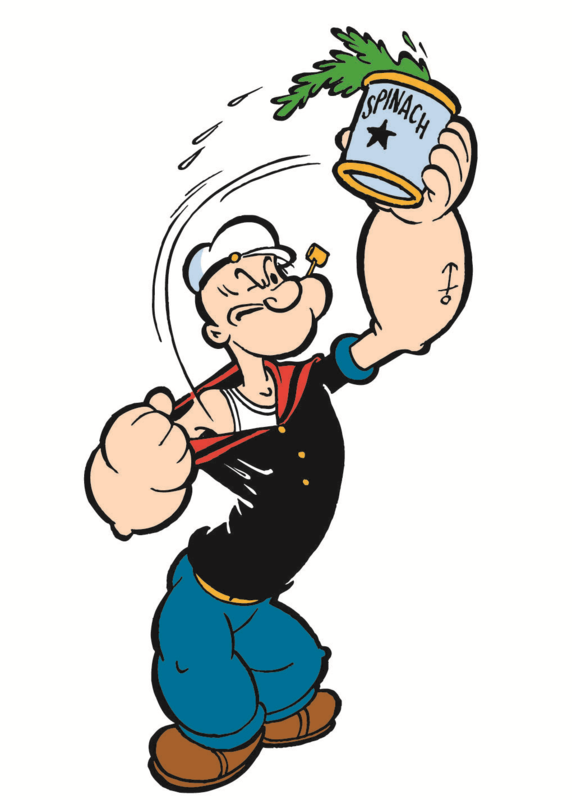 Secondly, I can carry only 10 discs to tackle a course, rather than having to lug around 20-plus to feel prepared. So, carrying only the CD2 and my mids and putters, I headed out to my local course to partake in the Workhorse Test. There was a slight hiccup, though: Santa Ana winds. For those who are unfamiliar with the phenomenon, Santa Ana winds are hellacious gusts that periodically hit Southern California to give us a taste of real “weather.” While readers in Texas, Kansas, and other landlocked regions may let out a hearty guffaw at my contention that this wind puts a major wrench in my game, it at least offers the opportunity to throw a new mold to the gauntlet. 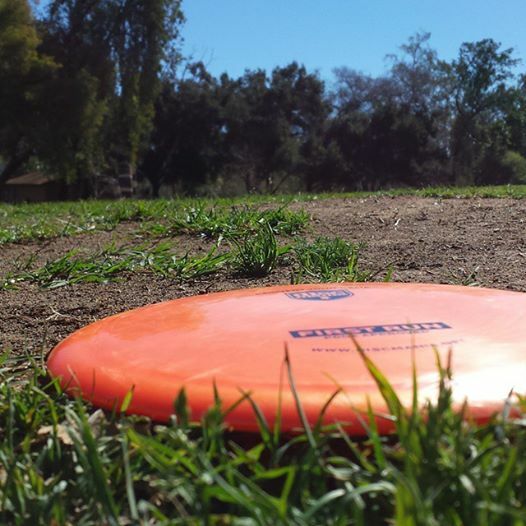 If a disc can handle the Santa Anas, it can handle pretty much anything. And the CD2 ate those Santa Anas for breakfast. Then spit them out and had a snack, too. Of course, I wasn’t throwing the CD2 flat that day; most discs will roll over in these kind of gusts thrown level, so I adjusted the hyzer angle and let the CD2 do its work. On most throws, it would easily flip up to flat, cut through the wind and still fade. Sure, it got jostled a little, but there was not one throw where it was tossed to the ground by the wind or – most importantly – one flight that made me lose confidence in its abilities. Now, I wasn’t throwing many different lines with the CD2, as survival was of the essence and the hyzer became sanctuary. But further testing during subsequent rounds continued to show that the CD2 could handle numerous shots. Hole 2 in the long position at Kit Carson Park, for example, calls for hitting a gap with a mandatory on either side while the basket is tucked back left into some trees. The gap is large, yes. But if you miss your line on the left you’re in jail, and if you miss right you’re out of bounds. 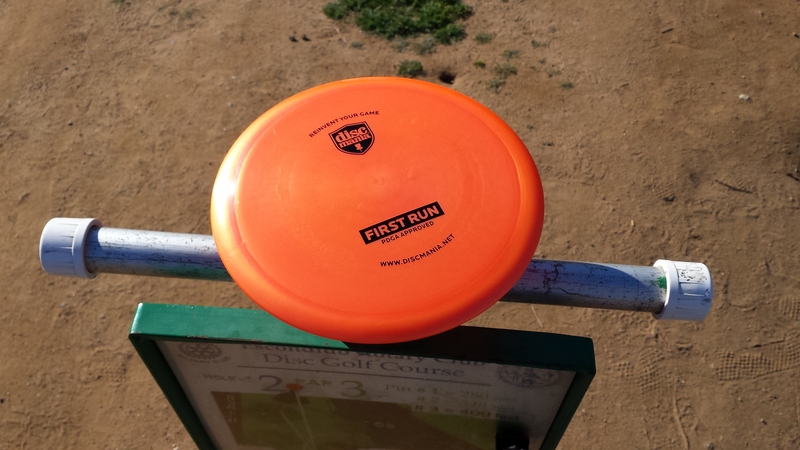 Thrown flat off the tee, the CD2 displayed a slow turn with enough fade to bring it back to center, similar to the flight of its younger Discmania brother, the FD. The line was tight and left me safe for my second shot, but what was most noticeable was the turn. For being described as the “most overstable” disc a low-powered player would need, I certainly had no problems getting it up to speed. 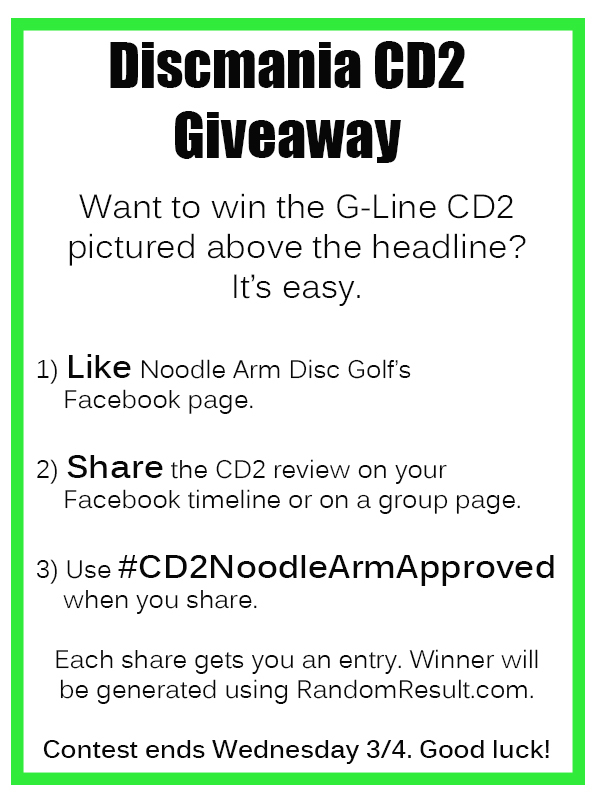 This is a development that, while diverging from the marketing lingo, left me encouraged that the CD2 was more useful for noodle arms than Discmania initially let on. The fifth hole at the same course is not one on which I would normally use the CD2 – it takes a long, backwards-C shape and I usually prefer to turnover an understable driver – but placing it on a big anhyzer and letting it flex back at the end yielded excellent distance and, again, a safe fairway landing. Truly, that’s the one word that keeps coming back to me when thinking of the CD2: safe. It makes its flight movements in more of a sudden fashion than something more graceful and glidey like the aforementioned Thief, so it wasn’t as fun to watch in the air. The CD2’s ending fade, for instance, is much more dumpy than forward penetrating, but it generally landed in the fairway when I needed it to. Still, there were a couple growing pains I noticed with the CD2 that might take some more time to iron out. While it can certainly flex out of an anhyzer, it also held it too long to the ground sometimes when I wasn’t intending to, so the release angle has to be pretty spot on. Also, if the nose got up a little more than I wanted to, it tended to rise high rather than fight through it, which really hurt me in the wind on a tricky downhill shot on hole 15 at La Mirada Regional Park. Instead of staying low, it found its way into the trees. I’m not one to blame a disc for performances like these, though. I know my limitations as a disc golfer, and I know I could have made adjustments to execute these shots. The CD2 excels at “safe” shots, landing in the fairway and putting a premium on control. Because the CD2 is marketed as being related to the PD, I wanted to get it into the hands of someone who regularly throws that mold. Enter Mike, my disc golf buddy and devout follower of the church of the PD. Mike generally has three or more PDs in his bag at any point in time, preferring to cycle them in different stages of wear to cover all of his tee shots. He absolutely bends those discs to his will, so I was curious to see how the CD2 would perform for him. On the whole, I noticed that Mike was able to put the CD2 on similar lines to his well-loved S-Line PD, at one point landing the two discs within a forearm’s length of each other. In order to achieve these lines, though, he would put the CD2 on a hyzer flip, while he put the PD on a shallow anhyzer. Different power requirements for both discs, to be sure, but as a result I would not hesitate to call the CD2 the noodle arm’s PD. Mike, however, noted to me that he couldn’t get the same shots out of his C-Line CD2 (which he did not bag on the day we threw together). It was noticeably more overstable, he said. As a result, noodle arms looking at the CD2 should lean toward the G-Line iteration for success. In the end, the G-Line CD2 lives up to its name: control. It is a disc that, while not flashy in its methods, truly gets the job done. And isn’t that what we all want out of a disc? Clockwork. And the CD2 is your Rolex. OK, maybe it’s not that fancy. It’s more like a Timex, but you get the idea. Just go with it. Makes me want to try more Discmania discs, as well as compare the CD2 to the Saint from Lat.